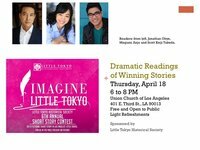 The Little Tokyo Historical Society has selected the winners for the sixth annual Imagine Little Tokyo Short Story Contest, which included adult, youth and Japanese-language categories. Winners will be revealed at a public reception on Thursday, April 18, from 6 to 8 PM at Union Church, Los Angeles. At the reception, actors Jonathan Ohye and Scott Keiji Takeda will present dramatic readings of the English-language winners' work, while actress Megumi Anjo will read the winning Japanese-language short story. Winners will each be awarded $500 and their short story will be published in The Rafu Shimpo and Discover Nikkei website. All finalists' stories will be posted on the historical society's website, http://www.littletokyohs.org/ by July 1. "We appreciate the efforts of every person who submitted a short story," said Naomi Hirahara, chair of the Imagine Little Tokyo committee. "To complete a creative work is an accomplishment in itself." The following served as final judges: adult English-language, Sesshu Foster, Irene Simonian and Teresa Watanabe; youth, Stephanie Nitahara and James Sherod; and Japanese-language, Shige Higashi and Duncan Williams. The reception, which will be held in the multi-purpose room of the church, is free and open to the public. Light refreshments will be served. lthistory . Última actualización Abr 10 2019 6:56 p.m.